In honor of the 100th Anniversary of New York State’s passage of the 19th Amendment, we are proud to open a very special exhibit highlighting the contributions of local women to the suffrage movement. 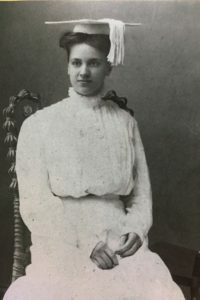 Women from Washington and Warren Counties were active in local, state, and national campaigns to obtain the vote for women. The movement faced opposition not only from men, but from women who felt that working with benevolent organizations was a more effective way to influence society. 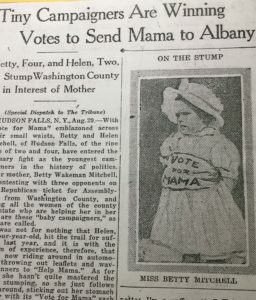 Still women persevered, working to gain support and at times campaigning for office, as Betty Wakeman Mitchell did in 1918 when she ran for NYS Assembly. Mitchell also actively campaigned for increasing public health nurses to help rural women in New York State. The strong Quaker tradition in parts of Washington County also heavily influenced the growth of the Suffrage movement. Many of the women involved were also involved in local temperance organizations. Overall, the exhibit highlights the contributions of area women and gives a peak into the life of women in this area in the early part of the 20th Century.